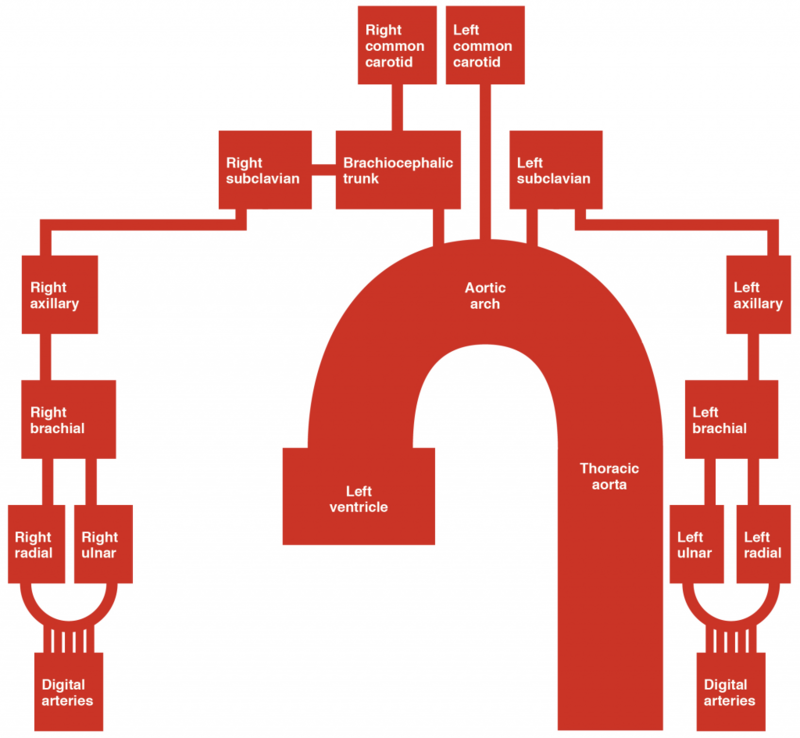 In this article, we shall look at the anatomy of the arteries of the upper limb – their anatomical course, branches and clinical correlations. Fig 1 – Schematic demonstrating the arterial supply to the upper limb. The arterial supply to the upper limb begins as the subclavian artery. On the right, the subclavian artery arises from the brachiocephalic trunk. On the left, it branches directly from the arch of aorta. 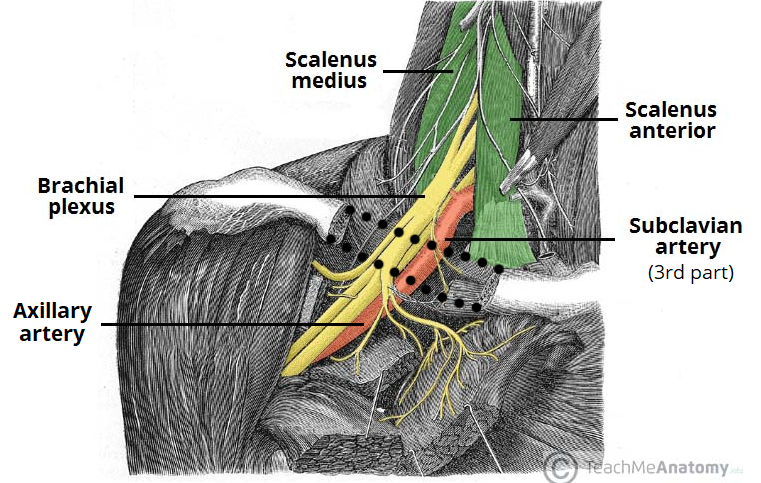 First part – origin of the subclavian artery to the medial border of the anterior scalene. Second part – posterior to the anterior scalene. Third part – lateral border of anterior scalene to the lateral border of the first rib. At the lateral border of the first rib, the subclavian artery enters the axilla – and is renamed the axillary artery. Fig 2 – Anatomical course of the subclavian artery. When the vessel crosses the first rib (not shown), it is renamed the axillary artery. The axillary artery lies deep to the pectoralis minor and is enclosed in the axillary sheath (a fibrous layer that covers the artery and the three cords of the brachial plexus). The anterior and posterior circumflex humeral arteries form an anastomotic network around the surgical neck of the humerus and can be damaged in cases of fracture. At the lower border of the teres major muscle, the axillary artery is renamed the brachial artery. Fig 3 – The axillary artery has three parts, named according to its position relative to the pectoralis minor muscle. An axillary artery aneurysm is a dilation of the vessel to more than twice its original size. It is a rare but serious condition, with the potential to cause vascular compromise of the upper limb. The dilated portion of the axillary artery can compress the brachial plexus, producing neurological symptoms such as paraesthesia and muscle weakness. The definitive treatment of an axillary artery aneurysm is surgical. It involves excising the aneurysm and reconstructing the vessel wall using a vascular graft. The brachial artery is a continuation of the axillary artery past the lower border of the teres major. It is the main supply of blood for the arm. 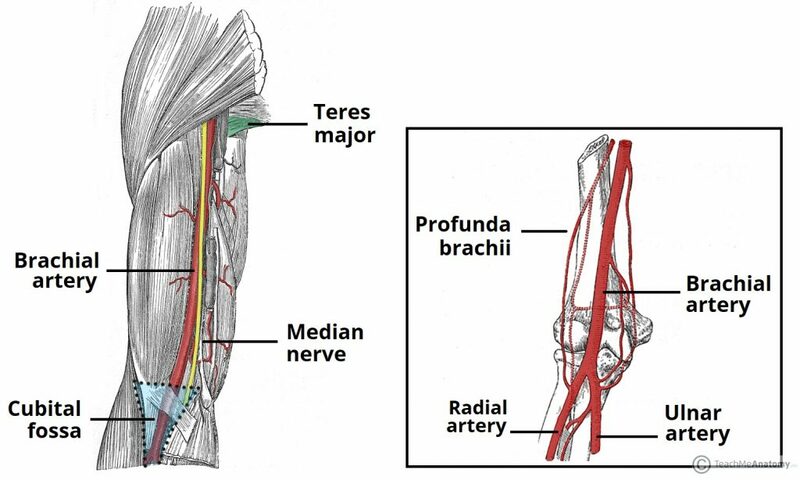 Immediately distal to the teres major, the brachial artery gives rise to the profunda brachii (deep artery), which travels with the radial nerve in the radial groove of the humerus and supplies structures in the posterior aspect of the upper arm (e.g. triceps brachii). The profunda brachii terminates by contributing to an anastomotic network around the elbow joint. The brachial artery proper descends down the arm. As it moves through the cubital fossa, underneath the bicipital aponeurosis, the brachial artery terminates by bifurcating into the radial and ulnar arteries. 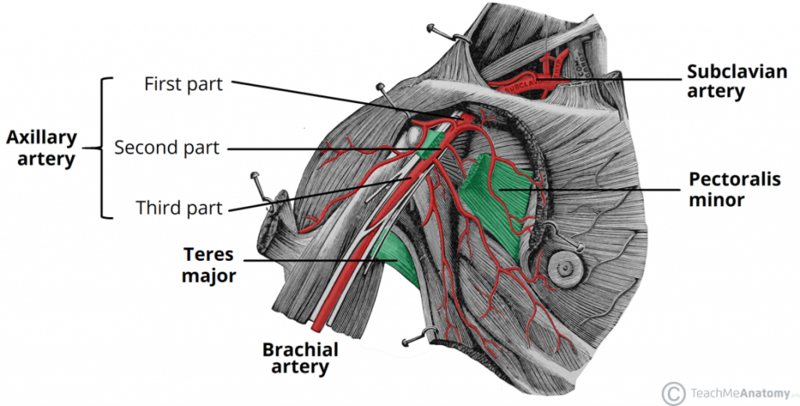 Fig 4 – The anatomical course and major branches of the brachial artery. Note its relation to the median nerve as it descends the arm. The arm has relatively good anastomotic supply. This means that it is well protected from ischaemia in cases of temporary or partial occlusion of the brachial artery. However, if the artery is completely occluded (or severed), the resulting ischaemia can cause necrosis of forearm muscles. Muscle fibres are replaced by scar tissue and shorten considerably – this can cause a characteristic flexion deformity, called Volkmann’s ischaemic contracture. Radial artery – supplies the posterolateral aspect of the forearm. It contributes to anastomotic networks surrounding the elbow joint and carpal bones. The radial pulse can be palpated in the distal forearm, immediately lateral to the prominent tendon of the flexor carpi radialis muscle. 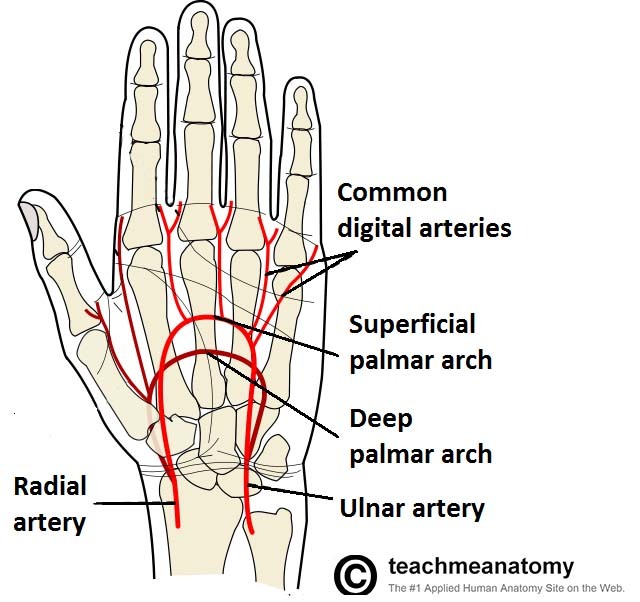 Ulnar artery – supplies the anteromedial aspect of the forearm. It contributes to an anastomotic network surrounding the elbow joint. 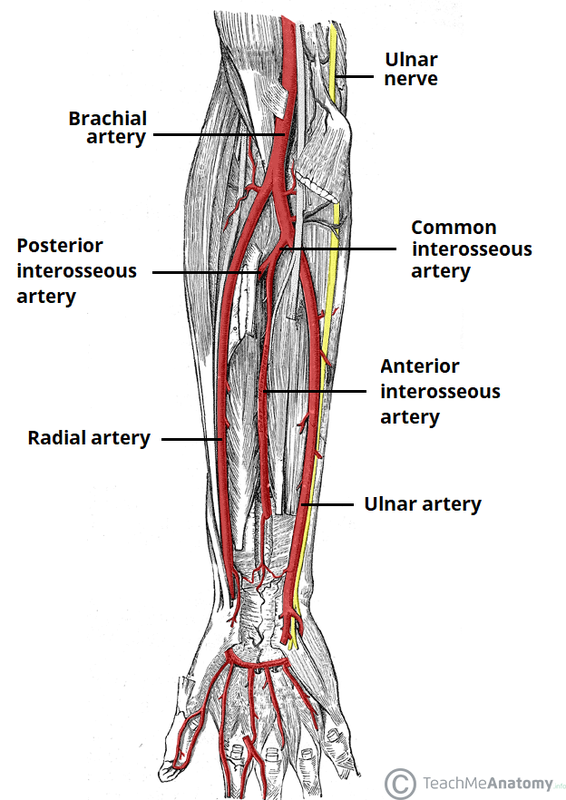 Also gives rise to the anterior and posterior interosseous arteries, which supply deeper structures in the forearm. These two arteries anastomose in the hand by forming two arches – the superficial palmar arch, and the deep palmar arch. Fig 5 – Arterial supply to the forearm via the radial and ulnar arteries. Note the position of the ulnar nerve relative to the ulnar artery. The hand has a rich arterial supply with many anastomoses between vessels. This allows the hand to be perfused even when under high resistance to flow (such as when grasping or applying pressure). Arterial supply to the hand begins with the ulnar and radial arteries. The ulnar artery enters the hand anteriorly to the flexor retinaculum and laterally to the ulnar nerve. It gives rise to the deep palmar branch and continues laterally across the palm as the superficial palmar arch. The radial artery enters the hand dorsally, crossing the floor of the anatomical snuffbox. It then turns medially and travels between the heads of the adductor pollicis muscle. The radial artery supplies a branch to the thumb, the index finger and to the superficial palmar arch – it then continues as the deep palmar arch. Superficial palmar arch – located anteriorly to the flexor tendons in the hand and deep to the palmar aponeurosis. It gives rise to the digital arteries, which supply the four fingers. Deep palmar arch – located deep to the flexor tendons of the hand. It contributes to the blood supply to the digits and to the wrist joint. A woman is undergoing an axillary clearance. During the operation, the axillary artery is identified within the axillary sheath. Which of the structures listed below is also found within the axillary sheath? Which muscle tendon can used as a surface landmark for palpation of the radial pulse? The axillary artery can be classified by its position relative to which muscle?